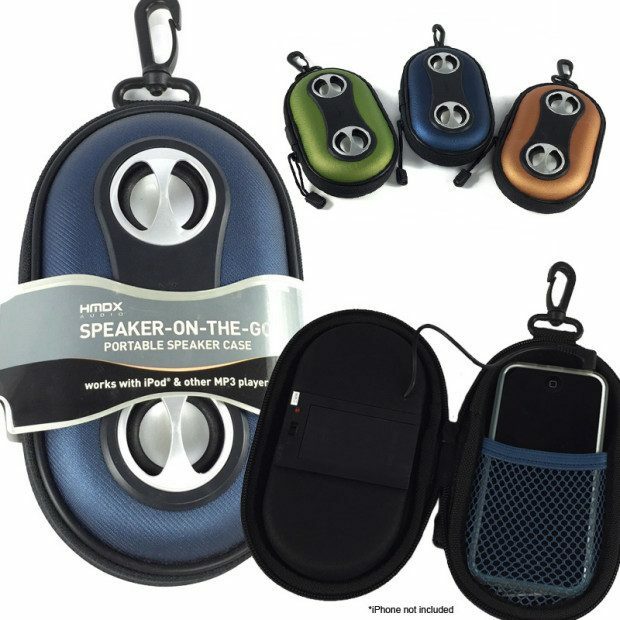 HMDX Speaker-On-The-Go Portable Speaker Case $6.99 Plus FREE Shipping! You are here: Home / Great Deals / HMDX Speaker-On-The-Go Portable Speaker Case $6.99 Plus FREE Shipping! The HMDX Speaker-On-The-Go Portable Speaker Case is your music, out loud and in color. I have one of these and it is great! Rock solid construction, I like that my iPod tucks inside the case so it is protected when I am on the go. Plug in your music device and hear your favorite songs through the speakers on the front of the case. Get the HMDX Speaker-On-The-Go Portable Speaker Case for only $6.99 Plus FREE Shipping! !